Strain the diced tomato (save the juice for tomorrow's recipe!). In a large bowl, add the remaining diced and chopped vegetables, as well as the oil and vinegar. Season to taste with salt and pepper, and refrigerate until well chilled. Once your sauce is sufficiently chilled, start to cook your pasta in well salted water (a good handful!). Strain the pasta, then place it in your serving dish. Drizzle with olive oil and toss until coated. Spoon your chilled sauce on the top, and serve immediately. This Italian pasta recipe celebrates summer with the freshest and ripest tomatoes. It's easy to make and tastes like you've captured the freshness of the season! The uniqueness of this dish is that the pasta is served piping hot and the sauce chilly cold, creating a temperature contrast that is both refreshing and unexpected. 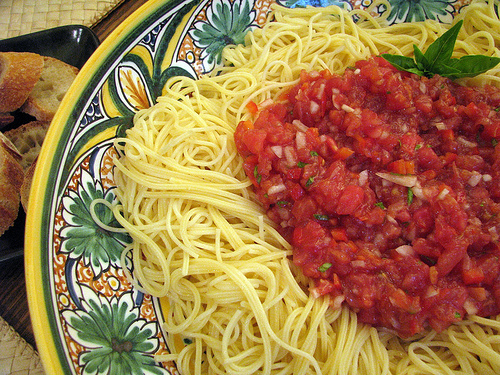 Once introduced to the heat of the pasta, the flavors of the tomato and olive oil burst with flavor.